Almost all of Erber’s music uses rhythmic processes of proliferation and contraction which are ultimately derived from a study of variation technique in early seventeenth-century music. These processes can be applied both to the formants with which he extends his basic material across the span of a large piece, as in the early Music for 25 Solo Strings (Epitomaria–Glosaria–Commentaria), or to the ‘grids’ – themselves patterns of rhythms, bar lengths etc. – which in the decade that followed increasingly came to constitute his basic material, so that an entire piece often consists of a pre-composed structure which is obscured by and occasionally glimpsed through multiple layers of decoration and permutation: although it is the layerings themselves, of course, which in the process become the music’s most characteristic voice. In taking as his starting point for Traces a memory of a ruin rather than the ruin itself, Erber had found perhaps an even closer point of reference than the gradually distanced object implied by the ‘epitomaria–glosaria–commentaria’ structure for the nature of his musical processes, in which the underlying grid would itself never be clearly stated and arguably had no separate existence within the piece (any attempt to realise it unadorned, as we shall see, would be essentially problematic). As he extended the cycle first, six and a half years later, into Traces B, and then, another eight years on, into Traces C, the nature of its concern not only with the memory of a ruin but also with the gradual ruin of that memory would become increasingly evident. Both more disparate and more consciously virtuosic than its predecessor, Traces B nonetheless shares the earlier work’s sense of semantic overload, of a richness and multilayeredness so extreme as to constantly threaten the music’s cohesion. The use of extended playing techniques defines much of the piece, as do constant changes of texture and behaviour. Towards the end, a bravura section featuring high staccatissimo runs occasionally cut into by multiphonic trills finally offers something akin to a sense of stable character and even of climactic function, but even this can only yield to a strange, muted conclusion of barely audible dynamic fluctuations. This valedictory music seems not only to close Traces B but also, in the context of the cycle, to bid farewell to the idea of narrative cohesion as such. Traces C carries over the use of descending glissandi on longer notes from this passage, but little more. The same rhythmic arch runs into this third piece but its treatment is very different in effect, a change which came about partly in accordance with shifts in Erber’s musical language in the decade since the earlier parts of the cycle had been composed, and partly in a reflection of the difficulties of ‘continuing in the same vein’ in a work-sequence which was already concerned with disintegration and which by now had to trace a path through the disintegration of disintegration itself. The lengthy grace-note groups and the generally constant high register that characterise Traces (at least until the entry of that ‘foreign voice’) and Traces B are considerably less in evidence here; the new focus on the flute’s lower register was a conscious decision on Erber’s part, and is achieved both by specific decisions made on the level of pitch structure and by an increasing concentration on playing techniques (lip pizzicato, tongue ram, key percussion) which can only be produced in the lower part of the instrument’s range. Like Traces and Traces B, the work reaches a critical moment near the end. But where Traces found an equilibrium of sorts, and Traces B withdrew at the very point where structural disintegration threatened, here it is the grid itself that we encounter, the work’s underlying material: exposed at last, but in such a way – at the slowest tempo used in the entire cycle, and with each component note decorated by just a small flurry of grace-notes – that the continuity of the line is threatened, not now by ambiguities of rhythmic and textural layering, but by the challenge the tempo and note-lengths pose to the player’s breath and lung capacity. 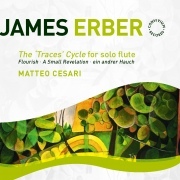 ‘Throughout the cycle,’ Erber has written, ‘the possibility of taking the music further has lessened with each piece. Here, finally, there is a situation in which a continuation is inconceivable. The music has arrived at its dissolution, as must the original memory that brought the cycle into being.’ The piece returns to the high register, where it concludes inconclusively, with five-second pauses separating four short, snapshot-like passages in which the layering techniques used throughout the cycle are applied at maximum density. Traces C was premiered by Matteo Cesari in May 2011, as part of the first complete performance of the entire ‘Traces’ Cycle. Written the following year as a ‘thank you’ for Cesari, the piccolo piece ein andrer Hauch takes its cue, and its title, from the third of Rilke’s Sonnets to Orpheus, a paean to the power of music figured in the idea of human breath. Two tempi alternate throughout the piece, the first presenting music which is dynamic and constantly mutating, created in typical Erberian fashion from multiple layerings of rhythmic and pitch material, the second subjected to a radical procedure in which all notes above a certain duration are written as harmonics – an extraordinary, unearthly sound, as if hollowed out of the instrument. In the work’s final stages the first type of music is hollowed out, too, the overlaying of different strata of material in the first tempo (which Erber associates with Rilke’s image of two arteries intersecting ‘where’, as the poet says, ‘is no temple to Apollo’) reaching a stage where rests in each layer cancel out the notes provided by the other layer, so that towards its end the work exists on a precipice of silence: grid and ruin, again and always.